Sir Magdi Yacoub reflecting on the FUTURE! unbelievable ... we can all keep on running! Fauja in Adidas 'Nothing Is Impossible' advertising campaign. He replaced David Beckham as Adidas’s new poster boy. On the Adidas billboards, spread across London, he was sitting cross-legged; as if cooling his heals after a day’s work out, peeping over Londoners, tired and overworked, telling them the secrets of his unfailing energy. Fauja Singh, Britain’s most popular Sikh is 98 now, the oldest runner in London Marathon. He is threatening to break his own world record of 5.40 hours in the 90 plus age bracket that he set previously. While running Marathon races in London, New York and Toronto, he raised thousands of pounds for various charities promoting Sikh culture around the world. He has also raised money for B.L.I.S.S., a charity dedicated to the care for premature babies. He describes it as the ‘oldest running for the youngest. Fauja’s jogging skills were developed on an Indian farm in Punjab, and then at the magical age of 81, when he moved to the UK, his love for the sport became more “serious”. 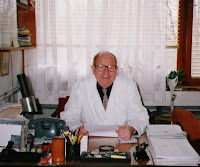 We were honoured to welcome Dr. Louis Ignarro on May 29 and 30, 2009. 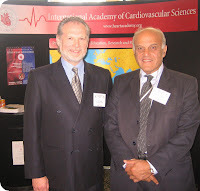 Indeed, his visit had originally been planned to present to Dr. Ignarro a 2007 “Medal of Merit”, the most prestigious award of the Academy “FOR OUTSTANDING ACHIEVEMENTS IN CARDIOVASCULAR EDUCATION AND RESEARCH”. His busy schedule led to the Award being presented before he could accept it personally. 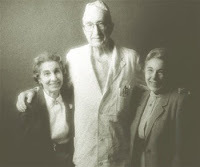 “Medal of Merit”, the most prestigious award of the Academy “FOR OUTSTANDING ACHIEVEMENTS IN CARDIOVASCULAR EDUCATION AND RESEARCH”. His busy schedule led to the Award being presented before he could accept it personally.